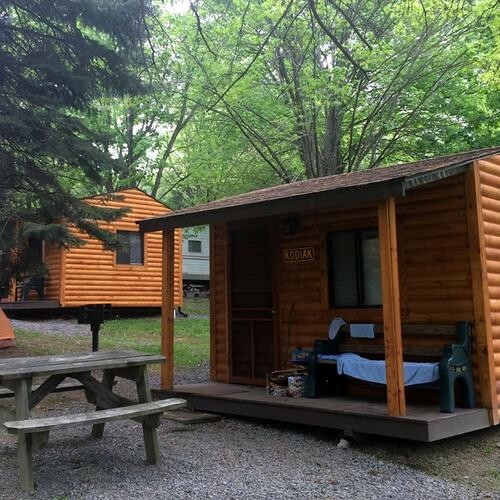 Your pet is welcome in these quaint cabins set up in the heart of the campground. Nearby are the pool, playground, arcade, and camp store and office. The Appalachians have been updated with a beautiful log cabin exterior and a rustic wooden interior, providing the perfect balance between roughing it and the comforts and amenities of home. These cabins are the perfect choice for a family of four, a small group of friends, or a couple looking for a cozy getaway. #’s 12 (Grizzly) & 13 (Brownie) on the map. Call for current rates and availability.